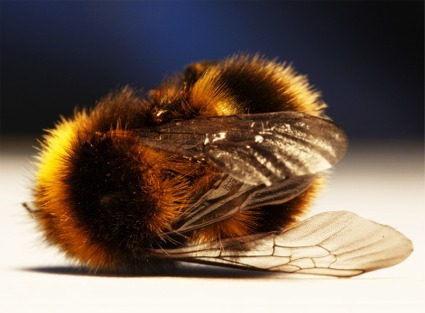 Bees are dying as are many species of insects around the globe. In some counties of Northern California, the insect populations have already declined some 90% as measured by a US Forest Service biologist. Aquatic insect life has seen the same level of decline in this region. Reports are coming in to geoengineeringwatch.org of similar insect die-offs from many locations around the globe. Though the scientific community is sounding the alarm about the die-off (at least in the case of the bees), they are even now completely in denial or oblivious to the highly toxic climate engineering and its effects on terrestrial life forms. I spoke to one of the head people at the National Bee Association and very carefully tried to inform her on the issue of global climate engineering and its likely connection to the bee die-off. She did not want to hear any data, and made it clear she had absolutely no intention of investigating. This was fall of 2013, the die off continues, and I have never heard a word back from this person. If the bees are succumbing to farm chemicals, why are they just as dead a thousand miles into the wilderness? If the die-off is from the cold winter in the US East (completely engineered winter storms), why are the bees just as dead in the west where record high temperatures have been the norm for too long to remember? So much of academia does not want to know the truth, but rather wishes to stay in comfort zones of total denial. I don’t say this lightly and I say if from a great deal of first hand experience. I have communicated with numerous individuals in academia from many different specialties and with very few exceptions I have found a near total absence of moral responsibility. Many of the so called “experts” are now in many ways accessories to the climate engineering crimes occurring in skies around the globe. Though there are still those scientists that are truly not aware of what is happening in our skies, for many others, their adamant denial of the climate engineering spraying and its effects is inexcusable. “More than three-fourths of the world’s flowering plants rely on pollinators, such as bees, to reproduce, meaning pollinators help produce one out of every three bites of food Americans eat,” the US Department of Agriculture said in a statement about the survey. Bees’ pollinating role adds $15 billion to the value of U.S. crops, including apples, almonds, watermelons and beans, according to government reports. “It was about the worst winter we’ve had in the past 20 years, for bee management and surviving bees,” Jerry Fischer, chief apiary inspector with the Maryland Department of Agriculture, said to the Baltimore Sun. Maryland lost nearly 50 percent of its honeybee population, an increase over previous years, which averaged about a one-third loss annually. Fischer said that many of the colonies he inspected last summer appeared to not have stored up adequate honey supplies to survive the unusually harsh winter. A Harvard study published earlier in May found that two popular insecticides – both of which are neonicotinoids – are the likely cause of Colony Collapse Disorder (CCD), the disease killing off honeybees and threatening pollination of the world’s crops. The researchers noted that the colder the winter, the more the severe the harm from the insecticides. “With the damning evidence mounting, pesticide companies can no longer spin their way out of this crisis,” Michele Simon, a public health lawyer who specializes in food issues, told Reuters. But neonicotinoid producers, including Bayer AG, Monsanto Co and DuPont, argue that mites – not their products – are to blame for the devastating loss. 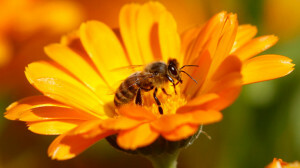 “Yearly fluctuations in the rate of losses like these only demonstrate how complicated the whole issue of honey bee [health] has become, with factors such as viruses and other pathogens, parasites like varroa mites, problems of nutrition from lack of diversity in pollen sources, and even sublethal effects of pesticides combining to weaken and kill bee colonies,” Jeff Pettis, co-author of the survey and research leader of the Agricultural Research Service (ARS) Bee Research Laboratory in Beltsville, Md., said in the USDA statement. Here in NC the Bee die off has been horrendous. We have lost 4 hives in the last 2 years, we have no more. A Bee Keeper we were buying honey from last year lost all of his 20 hives and had to start all over again in 2014. My other friend lost 5 out of 6 hives. The one hive that survived was in the barn. I am having to hand pollinate some of our garden veggies because at most, I see one bumble bee at a time. This is frightning to say the least. Even Carpenter Bees are very few. It is curious that no one has considered the significance of the disappearing worker bees. Bees — like birds — are dependent on being able to stay oriented to distance and direction. If the colonies are collapsing because the worker bees can't navigate, it seems to me that the culprit must be HAARP. Who else could be blindfolding the bees by doing things like ionizing the troposphere and filling the air with toxic particulates, nano-particulates, and worse. I also have seen insects entangled in chemtrail webs. Whatever is responsible, it saddens me to reflect on the bees who can't find their way home. Hello Amy, I have many times brought to light the connection between colony collapse disorder and the aerosol operations/RF transmissions. I have spoken to some of the head bee people in the country, they are def to the facts, they won’t listen and don’t want to know. I’m no meteorologist but I’m truthful which is far from these people and so-called profession. By observation looking due westward of Las Cruces, N.M. area and Mesilla Valley these lowlifes this evening were laying down heavy chemtrails over same clouds coming in from West (0-was left of clouds) moving north of us if any were left of clouds. As far as activism rally’s I’ve only walked in 1 against GMO’S several months back in L.C.,N.M. with a small group. Other activity for some years back I’ve contacted State Senators for same state, for line of bull fed back in letters from Wash. D.C. stating from again so-called higher ups telling me what I’m complaining about are contrails. I hope this somewhat qualifies me as not leaving it all up to God… Not being mean you can understand I hope. Unless a multitude of people actually get their feet on streets and try to shed light with heavy public input these bunch of lowlifes laugh at us. You must know they like to intimidate. I believe they want protest anyways from people that will give them an excuse to knock us all on our heads (or gas us more) and pen us up in the empty pens around you may have heard of (martial law). Much tension going on with many lies and so much corruption. Last I heard they are working on Patriot Act 2. We are far from being a free country, we are led to believe though with many naïve people. As a whole in this country there is much improvement needed here. Only God can truly free us. Don’t put your trust in Man. Thank God they can only kill us once the word says. The Lord’s peace be with you….5-21-14-9:30 p.m. I ran out of ink! I also live in the Southwest. In Arizona in a Rural Area. Last year the bees were very aggressive. Everytime I went outside to water, They were very angry & I was not aggressive at all towards them. I have always loved bees & ants. They are really hard workers.This year I have only seen 3 bees.I am really worried/ I had planted different plants & flowers, That the bees & butterfly’s like. I see dead insects & I can see that they have nano technology in them! If there is anyone, That doesn’t know how to Identify the nano’s, There are two things to look for. It is called Smart Dust! When you sweep your floor, After you are done, Hold it up towards the sunlight or light. You will see very tiny shiny things, Almost like what would fall off your ornaments. If you hold a butter knife to one of those shiny objects, it will jump on the butter knife.I have done this several times. If you get a magnifying glass & rub lotion on your skin, Some of them will emerge from your skin. They are very very tiny black objects, Almost like pepper, Only smaller. I think they emerge, Because they are Oxygen Species & perhaps it cuts off the oxygen.You cannot get rid of them this way, But it is a way, To see for yourself.But when you look at them in the microscope, They are long nano fibers & have hooks on the end of them. That is how they get on your Shoes & Clothing, etc. If you do the Red Wine Test & swish red wine in your mouth, For six to seven minutes & gargle, If you have a white sink, You will spit the long nano fibers out in the sink. I cannot emphasize “Enough” the seriousness of the situation we are In. It is in the Plants, The Soil, Wildlife, Insects, Everything. We are breathing them In & They are also going through our skin!Everyone is exposed & as soon as it wears down your Immune system, You will become Ill. We are being sprayed with them, In the Geo Engineering aka Chem Mix. They are Geo Engineering Us Also!! !Only it is Bio Engineering!! I read one of JRS posts. He said we were stewards of the Earth. That God wanted us to take care of the Earth. It also means, That those that are in Authority & Responsible should be held Accountable! I also believe in God. But I am not so weak, That I expect God to take care of this Problem. Sure I pray to God.But I do not expect God to make this go away!But I know he will be with me & by my side.. I am ready to put on Gods Armor & Take a stand & make sure that those responsible, Be held Accountable. I am praying everyday, That everyone will wake up! And that people will not be like Sheep & led to the Slaughter. Has anyone seen the new movie: More Than Honey? It is the most informative and even upbeat movie about honey bees Ever. The people are forthcoming and open about every bit of this. For instance, one bee pimp laments as his bees work the insanely, linear, massive almond industry, that they spray the almond trees in the daytime when the bees are active instead of at night when they are in their hives, as the almond groves are too dense and too large to see at night. You get to witness the point of view of the bees close up and personal as they travel from grove to grove all over the country–bumpy, noisy, rough travel, inhaling fumes and getting over heated. Bee keeper/pimp says that thanks to monoculture he has to keep moving as nothing else growing and blooming nearby for his bees to eat. Stressed animals, bees, people, and plants, are made vulnerable to such things as mites and pathogens. Just as beetles kill stressed trees. No doubt chemtrails have a negative affect, but studies have shown that EMFs seriously affect all airborne creatures. Electrosmog. Wireless everything is majorly affecting our pollinators. And ourselves. Leave it to humans to find yet another way to pollute the air! Just think about all the “traffic” our pollinators are flying though. I saw this coming long ago, yet here I am contributing. Today 5/21/14 at 10:10 a.m. with a real nice cloud cover here in the Southwest N.M. area we had them busted to nothing real quick. Funky colors (residue) of pinkish, greenish, purple and other mix colors were left in wake of chemtrail spraying, nothing new because that’s what these scumbags do best for a living. The word says the dog returns to its vomit and eats it up (2 legged dogs in this case). Pretty hard to put Love in this mix. Evil has taken over their soul which they have none left of obviously. Unless they change their way I believe they have no hope in the life hereafter as is promised. The Lord will come like a thief in the night which these lowlifes don’t even bother to hide from in their thievery . We are in extreme SE Arizona in a very rural location. We don’t have freezes normally – sometimes temps get into the 20’s but every day back into the 60’s. Last fall a hive would swarm all over the yard, threaten to intrude into our home, etc. After considering this article we just realized… they’re gone. So are hummingbirds. Last year they were all over us during May. Now we wait in vain, having planted salvia and other plants to attract them. Others report the same. Neighbors took a field trip into Ramsey Canyon outside of Sierra Vista, AZ, where normally 100’s of hummingbirds are around in May. They saw perhaps 20, tops. An elderly farmer says barn swallows are not nesting as usual in her carport. They occasionally show up and nose around, but no nesting. Everything just weird. For the past four weeks off and on we’ve had violent HAARP winds. Like having a freight train pass by overhead all day long. We think this might have compromised the bird/honeybee population. Really not so many birds around in general. Reports from MT (my home state) indicate all the chickadees are gone, sage grouse and pheasants too. Fish die-off in major rivers. Years ago my husband and I kept a few hives of bees mostly for our own benefit as we also had a garden, fruit trees, etc. The majority of people do not realize how interesting and complex bees and their colonies are. And most important of all, they don’t have a clue how critical to human existence the honeybees are. TOO MANY PEOPLE THINK OF THEM AS A NUISANCE AND SOMETHING TO SWAT AT RATHER THAN THE MARVEL OF CREATION THAT THEY REALLY ARE! The ignorance of people on so many critical levels is appalling. Once again I am surprised beyond belief .. How can anyone not recognise ..or at the very least, take into the equation, that Geoeengineering is having a major affect on bees .. It’s effecting human beings it’s certainly going to effect a bee … Fed up with closed minds .. They have to take responsibilities for their ignorance to this … If not now .. Certainly in the future …. My poor innocent grandchildren … Makes me want to love them even more than I do now .. If that’s possible … Thank you greedy ,arrogant ,and ignorant dishonest people for giving all little children ..a future without hope or promise …..Sorry … I am so annoyed with the bee women … One of the Heads of the Bee Association … Still can’t believe anyone could be in such denial … Wake up dear there won’t be any daisies for us to smell if you don’t understand your home ..our earth …and what is becoming so blatantly obvious to a lot of people now .. You don’t need a science degree to work it out …. Sorry Dane .. I’m annoyed …. Just shared this link with Organic Consumers Association. Dane, thanks for lesson in logical thinking. Our survival and survival of future generations is so dependent on this concept. Once taken for granted as an integral component of our education process, now realize our public education system teaches exactly the opposite…..ie opinion and fact are of equal value. Or as so many are fond of saying today “it’s all good”.